Intel has enjoyed great success with their NUC lineup of ultra-compact form factor (UCFF) PCs. They have segmented the NUCs into three markets – the entry-level, mid-range, and enthusiast. The enthusiast segment is served by H series processors and the mid-range by the U series processors with the Core architecture. The entry level is served by Atom-class SoCs. Intel launched the Apollo Lake SoCs with the Goldmont CPU architecture in the second half of 2016. The NUC models employing one of the Apollo Lake SoCs was given the Arches Canyon codename. The NUC6CAYH targets the entry-level and developing markets. It employs the same form factor as the previous-generation NUCs, and supports a 2.5″ SATA drive (indicated by the H in the product code). Intel’s Apollo Lake SoCs improve upon Bay Trail and Braswell by adopting a newer microarchitecture (Goldmont) for the CPU cores and also getting fabricated in a more power-efficient / mature 14nm process. In the consumer market, the Goldmont cores are exclusive to the Apollo Lake family. The SoCs target the netbook and nettop markets, with 6W and 10W TDP SKUs. We reviewed the ECS LIVA-ZN33 UCFF PC last year. It used a 6W TDP Celeron N3350 due to its fanless nature. The Intel NUC6CAYH, however, is actively cooled, and goes for the Celeron J3455 with a 10W TDP. Arches Canyon has two SKUs – the NUC6CAYH, and the NUC6CAYS. The main difference between the two is that the NUC6CAYH is barebones, while the NUC6CAYS is ready to use out of the box. The ‘S’ SKU has a 2GB DDR3L SO-DIMM pre-installed, along with 32GB of eMMC flash on the board. Windows 10 Home x64is also pre-installed. 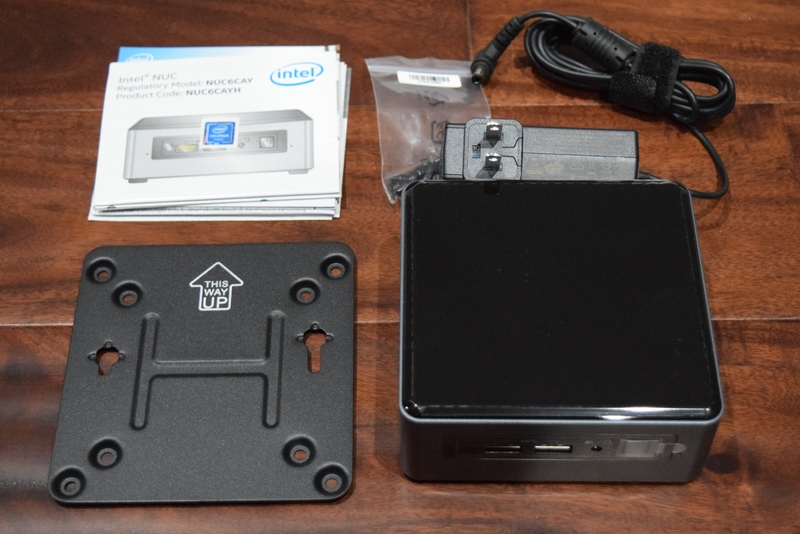 We received the NUC6CAYH for review, and completed the configuration with a Corsair Vengeance CMSX8GX3M2B1866C10 DDR3 SODIMM kit (2x 4GB) and a 500GB Crucial MX200 SSD. The full specification of our review configuration is summarized in the table below. 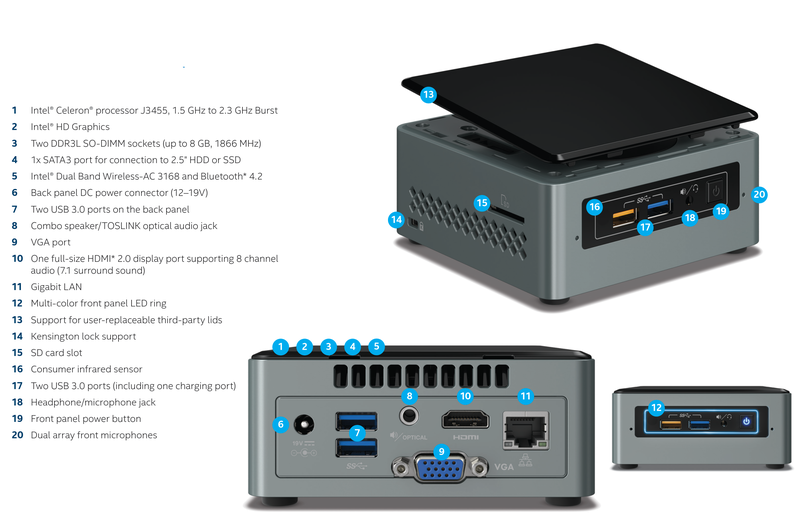 The NUC6CAYH package comes with a 65W (19V @ 3.42A) AC adapter and a VESA mount / screws in addition to the main unit. One of the interesting aspects of the NUC6CAYH is the integrated dual-array microphone. This allows the end user to configure it as an always-listening machine (if needed), without the need to connect an external microphone. The other selling point is the availability of a HDMI 2.0 port with HDCP 2.2 support. 4Kp60 capability is present, allowing for specific digital signage use-cases. It also lends itself to usage as a HTPC capable of driving a 4K display. The specifications of the Intel Celeron J3455 indicate that the SoC can support up to 6 PCIe 2.0 lanes, 2 SATA ports, and 8 USB ports. The break-up of the high-speed I/O lanes is interesting in the context of the four USB 3.0 ports and SDXC slot in the NUC6CAYH. The distribution of PCIe lanes in the NUC6CAYH is as below. Since none of the PCIe lanes are multiplexed with the USB 3.0 lanes, we do not have any bandwidth-sharing issues or bottlenecks. In the table below, we have an overview of the various systems that we are comparing the Intel NUC6CAYH against. Note that they may not belong to the same market segment. The relevant configuration details of the machines are provided so that readers have an understanding of why some benchmark numbers are skewed for or against the Intel NUC6CAYH when we come to those sections.